Scale insects have been the subjects of posts here twice before: in the first, I described their remarkable development, and in the second, I referred to the unusual genetics of some species. An appropriate next subject would, I suppose, be some of the ecological connections between scales and other animals. Cochineal insects Dactylopius coccus on prickly pear, photographed by Joan Mundani. Which starts, of course, with connections between scales and ourselves. 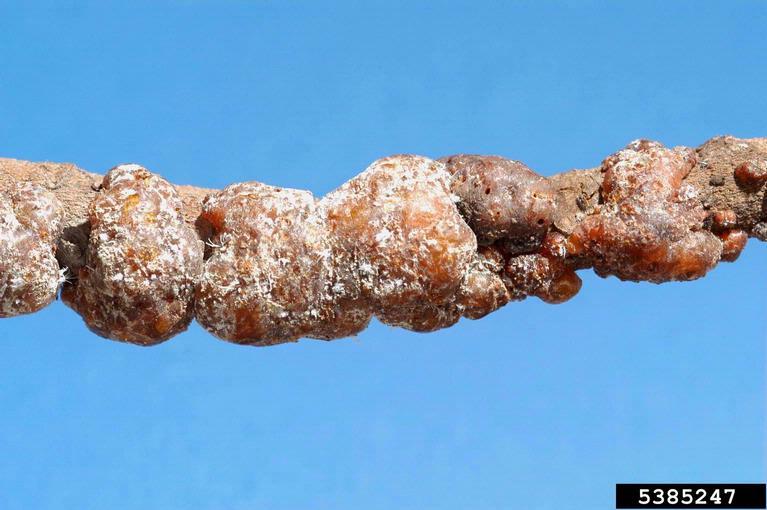 Many scales are known as agricultural and horticultural pests, such as the red scale Aonidiella aurantii that attacks citrus. However, some scale species are not only welcomed but even deliberately cultivated due to commercial usage of the resins that they secrete. The two most significant commercial scales are the cochineal insects of the genus Dactylopius and the lac insect Kerria lacca. Other scale insects have also been used to produce similar products to those extracted from these species. Cochineal insects live on prickly pears, and produce carminic acid to ward off insect predators (though one predator, the caterpillar Laetilia coccidovora, is not only immune to the acid but stores it up to regurtitate at its own predators: Grimaldi & Engel 2005). Humans, on the other hand, are undeterred by carminic acid. The insects are collected, crushed, and the carminic acid extracted to produce the red dye cochineal, used (among other things) to give colour to food, or to dye fabric. It was an ill-fated attempt to establish a cochineal industry in Queensland that lead to the introduction of prickly pears to Australia: the plague-proportion spread of the prickly pears and their subsequent control by the moth Cactoblastis cactorum has become one of the textbook examples of biological pest control. Branch covered with sticklac, produced by lac insects Kerria lacca, photographed by Jeffrey W. Lotz. Lac insects produce a hard resinous shell for protection that, again, is their undoing in the eyes of humans. Sticklac, the twigs of trees covered by lac bugs, is harvested, then heated in canvas tubes. The resin melts and runs out through the canvas, leaving the wood and remaining insect parts behind. The resin is then processed to make the lacquer shellac. As a varnish, shellac has been mostly superseded by synthetic products, though it still has its afficionados. It is also used in the food industry to produce a shiny coating for confectionary or fruit. 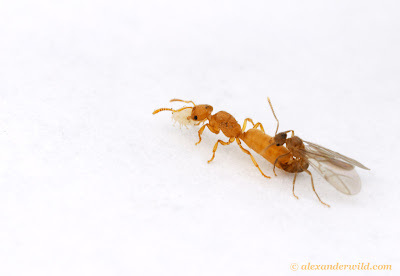 Mating pair of the ant Acropyga epedana, photographed by Alex Wild. The queen is carrying the mealybug which while found the stockline for her new colony. The use of scale products by humans has a long history. The Indian epic Mahabharata, believed written about the 8th century BC, describes the Lakshagriha, a highly flammable palace built by the Kaurava family out of shellac, jute and ghee in which they hoped to trap their enemies of the Pandava family (the Pandavas escaped through a tunnel when the palace burnt after having been warned by their uncle, though one wonders if the smell of ghee in the walls might have also aroused their suspicions). However, ants have been exploiting scale products for at least 40 million years, and probably much longer. Ants (like many other animals) are interested in scales for their honeydew, the excreted sugary waste from their sap diet. Ants not only collect the honeydew, they protect the scales from other insects and may carry them to fresher growth or more protected sites. Ants of the genus Acropyga are so dependent on mealybugs, waxy scale insects of the family Pseudococcidae, that when a young queen leaves her parent nest to mate, she will carry a mealybug with her so that her new colony can maintain its own stock. She even mates while holding on to it, as seen in the photo above. Acropyga queens have even been found preserved in Dominican amber, still carrying their mealybugs (Grimaldi & Engel 2005). Grimaldi, D., & M. S. Engel. 2005. Evolution of the Insects. Cambridge University Press. Hi there! 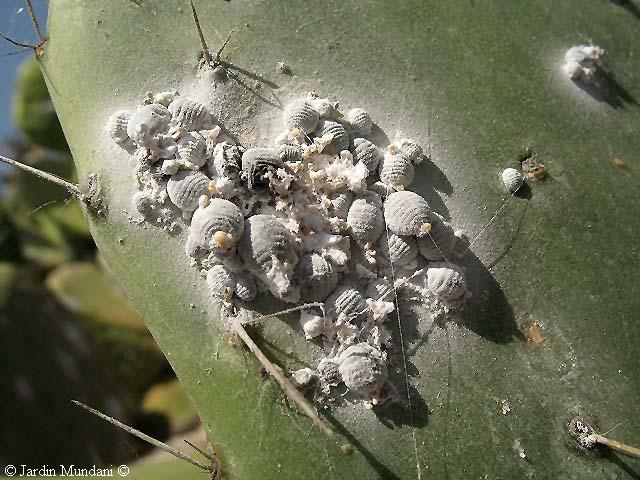 Actually in Madeira Island we used to have plantations of Opuntia tuna for these insects! The main goal was to extract carminic acid. It's fun to read about it. Reminds me of my botanical classes, and why O.tuna turns out an invasive plant in our island! Cheers! Nice story. I noticed that the examples you gave of ants harvesting scale products were all of the suborder Sternorrhyncha, including aphids, of which I was aware previously. Do you know of any harvesting of products from bugs outside this suborder by ants? The aphids are an interesting story on their own. A relatively new blog, As Many Exceptions as Rules (http://biologicalexceptions.blogspt.com), recently discussed horizontal gene transfer in aphids as part of a story on a photosynthesizing sea slug. I invite readers to check out this blog that tells the stories of organisms that seemingly break natural rules in order to survive and thrive. As a varnish, shellac has been mostly superseded by synthetic products, though it still has its afficionados. Not just as a varnish. We owe the survival of a lot of good music to those little beasties, even though the technology has moved on.